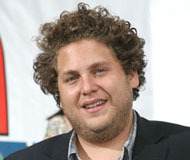 Jonah Hill was born Jonah Feldstein in Los Angeles, Calif. His father is a casting agent and his mother is a producer. He attended Crossroads School in Santa Monica. In school, he began taking drama classes, but lost interest in acting due to a lack of motivation from his peers and teachers. After graduating from high school, Hill left California to attend school at New York University's Tisch School of the Arts, where he studied drama. During college, Hill began writing and performing his own plays and performing them himself in a bar called Black and White in the East Village. His plays developed a small following and helped him to realize his desire to begin acting in films. Hill befriended Rebecca and Jake Hoffman, actor Dustin Hoffman's children, and they introduced him to Dustin Hoffman. While at a summer job in L.A. making boxes, Hill received a call from Dustin Hoffman, who asked him to audition for a role in his movie "I Heart Huckabees." Hill quit his job, and "Huckabees" was his first movie. Following "Huckabees," Hill secured a manager and asked them to introduce him to writer-director-producer Judd Apatow. His manager introduced him to Allison Jones, Apatow's casting director, and Hill auditioned for a small part in "The 40 Year-Old Virgin." Hill got the part, and it would be the start to a steady working relationship with Apatow. Hill then joined the cast of the Oxygen network comedy series, "Campus Ladies," as Guy Ferguson. However, his breakout role was as Sherman Schrader in the college comedy "Accepted," in which he starred alongside Justin Long. Hill and Long soon became good friends — frequently working together and helping each other get parts. They have gone on to appear together in the films "Strange Wilderness," "One Part Sugar," and an episode of "Campus Ladies." Hill left the cast of "Campus Ladies" after its first season to focus on his burgeoning film career. Apatow again cast Hill in a supporting role in the hit 2007 hit comedy "Knocked Up," starring Seth Rogen. In the film, Hill played an exaggerated version of himself with his own first name. After landing a supporting role in the 2007 Biblical comedy "Evan Almighty," Hill landed his breakout role in another Apatow film, "Superbad," which cemented his status as a top up-and-coming star in Hollywood.